The purpose of Hutchinson Salt Company begins with integrity. We are a family owned business, located in the heart of Kansas, with a passion to inspire people by allowing growth and development through leadership. Our company is dedicated to creating a safe environment and workplace by investing in our employees and the people we serve. As a working salt mine 650 feet below the Kansas prairie, Hutchinson Salt Company strives to work diligently and safely to offer the highest quality of rock salt for road deicing as well as for agricultural needs. Now Offering 1-Ton Lined Bulk Bags! 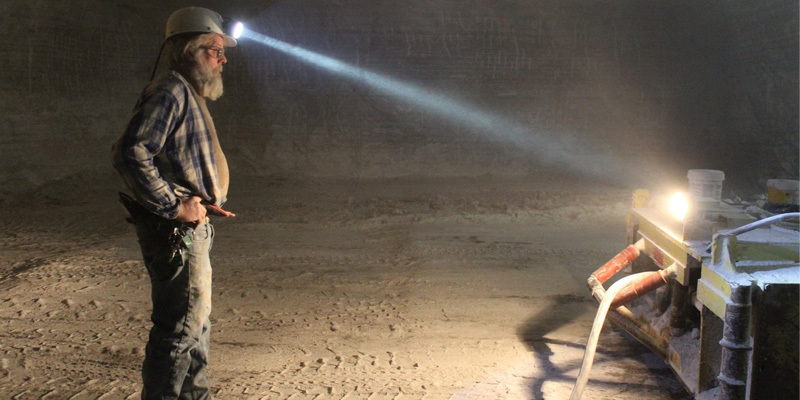 With over 25 years proudly and safely serving, Hutchinson Salt's history and commitment to superior service makes us a leader in the salt mining industry. Hutchinson Salt Company has been featured on History Channel's "Modern Marvels", Discovery Channel's "Dirty Jobs" and has also had a documentary video done about the history of our company. View our gallery of videos and photos. Chuck Breitbach Retires after 12 Years with Hutchinson Salt Co.
Read full article at Hutch News. Dan Howell RETIRES AFTER 28 YEARS WITH HUTCHINSON SALT CO.
Bruce Taylor Retires After 25 Years with Hutchinson Salt Co.